Our Guide Instructors have over 40 years of combined experience guiding fly fishing and whitewater trips. Each of our instructors has their own unique method of guiding. Their insights will help you to develop your own approach and techniques. Below are some quick bio’s on our main instructors, they and other talented RIGS guides will teach you what it takes to be a fly fishing guide! RIGS Fly Shop & Guide Service owner and founder Tim Patterson has led fly fishing, rafting, and eco-tours throughout Central America, Mexico, and the Southwestern U.S. for the last 25 years. Tim created the RIGS Whitewater Guide School in 2001. RIGS Head Guide Matt McCannel started his career in 2004 and leading three-day expeditions within the Gunnison Gorge and is also a premier tailwater guide on the Uncompahgre River within Ridgway State Park’s “PACO”. Matt has earned the unique distinction of becoming a SAGE Ambassador, SIMMS Ambassador and is also a royalty fly tier for Umpqua Feather Merchants. Client Assessment – identifying client needs, wants, physical conditions, limitations and desired outcome. Ensuring client comfort, safety and appropriate attire. Organization and Cleanliness – Making sure your vehicle is clean and in working order. Be prepared for each day: lunch/beverages, pre-rigging, cleanliness & organization of vehicle, rods & gear. Maintaining clean, professional attire and instilling confidence in your guests. Commercial Permit Management – understanding the stipulations and your role in maintaining the outfitter’s permits. Timing – assessing your surroundings, arrival and departure times and awareness. Conditions – Understanding how varying conditions such as seasonality, water flows, hatches and weather conditions can affect your trip. Using good judgement to keep your client(s) safe. Environmental and Resource Stewardship – Protecting your fishery and environment through education and outreach. 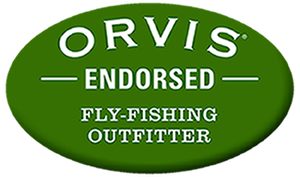 How to be an advocate of the fly fishing industry through client interaction and instruction. Entomology – Identifying classifications and life cycles of aquatic insects. Reading the Water – Understanding trout holding waters, habitat and feeding lanes. Basic and Advanced Knots – Learn which knots to use in different situations. Rigging – Learn to efficiently rigs rods for clients and advanced fly fishing setups. Proper Landing Techniques – Techniques for fighting and landing fish, netting and release. Proper fish handling. Angler Etiquette – Respecting the other anglers on the water. Ethical practices and seasonal sensitivities . Casting techniques including mending, dry fly presentation, double haul, single haul, nymphing strategies, Czech/Tenkara, single and two handed techniques. Understanding Fly Rods and Reels – Performance and selection. Fly lines, leaders and tippet – Understanding these tools, their uses and benefit/disadvantages of different products and materials. Guide Essentials – What you’ll need to guide a trip – backups, redundancies and accessibility. Your gear and accessories – proper care. Photography – learn techniques to provide high quality photos for your clients to remember their time on the water.